This week, Apple rolled out its new iTunes Pass service for storing any iTunes or App Store credit you may accrue through gift cards and e-cards. Say “Begone!” to plastic iTunes gift cards; after you enable iTunes Pass, you can go directly to an iTunes Store and have one of Apple’s Specialists load some money directly into your account. Here’s an overview of how to set up iTunes Pass on your own iPhone, as well as how to give your friends and family the power to give you some sweet sweet iTunes capital. Tap View Apple ID in the pop-up that appears, and sign in if prompted. Then scroll down to the iTunes Pass section and tap Add iTunes Pass to Passbook. 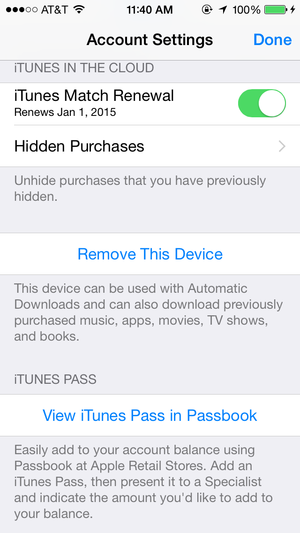 Your new iTunes Pass will appear, loaded with whatever store credit you currently have; tap Add to store it in Passbook. 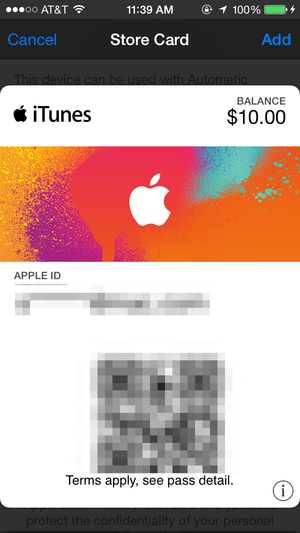 If you have other Passbook gift cards, the iTunes Pass will look awfully familiar: It sports the iTunes logo in the upper left, a balance in the upper right, your Apple ID (partially obscured for security), and a QR code for the Specialist to scan. Tap the info button for the usual Passbook preferences (automatic updates and whether the card should show up on the lock screen when you’re geographically near an Apple Store) along with your full Apple ID, the terms and conditions, and the numerical ID associated with your iTunes Pass (in case, for whatever reason, the QR code can’t be scanned). When first thinking about the iTunes Pass, I wondered about its practical use: Sure, it makes sense if you’re loading up gift cards in-store for a family Apple ID, but Family Sharing (coming in iOS 8) should make that scenario redundant. And besides, when you can also send iTunes credit via email, why go to a store? But the answer lies in iOS’s ability to share Passbook cards. When you view your iTunes Pass, Apple’s Share button appears in the lower left-hand corner. 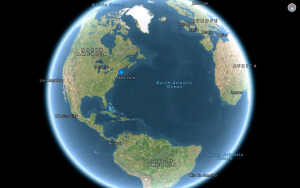 Tap this, and you can send that pass to anyone you feel like via AirDrop, Messages, or email. The recipient won’t be able to access your iTunes credit, but instead, they’ll be able to easily add money to your account when in-store without wasting paper and plastic purchasing a physical iTunes gift card. It still seems a little cumbersome in comparison to Apple’s digital tools for adding iTunes credit, but it does provide yet another tool in the company’s arsenal when it comes to making it easy to spend money on digital goods. And given that the company earlier this month reiterated its goal to trim down its environmental footprint, enabling another method of digital purchasing is one way to make a difference.